Ages 4 through 10. The humorous story situations in this product help children use language to solve problems. The situations center around the adventures of Gorlin the Gorilla, a humorous character who seems to encounter problems wherever he goes. 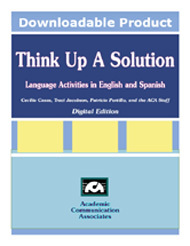 English and Spanish versions of the stories are included so that you can use the activities with English speakers, Spanish speakers, or students who speak both English and Spanish. Read each story situation to the student and ask the student to think of an appropriate solution for the problem. Each story includes a full-page picture showing the story problem. A small version of this picture is included on the story text page. The story text page includse both English and Spanish versions of the story. All picture and story pages may be reproduced, making it easy to use this product at school or at home. The activities build basic problem-solving skills that are critical for success in school and in social contexts. Your students will love helping Gorlin the Gorilla solve the many problems that he encounters in everyday situations. The stories are suitable for students with communication disorders, students learning English, and others who need help using language to solve problems. This product can also be ordered on CD. If you would prefer to order the CD, click here.